All residential clients curbside or driveway service must have waste and recyclables out and ready for collection before 7 AM on your collection day. In order to keep up with our service we will not be responsible for any second trips or re-attempting service if your pick up is missed because you do not have your items out or we do not have complete access to your items. We all know as New Englanders what we have to put up with between rain snow and ice. To ensure your waste and recyclables are never left behind. Always make sure your driver has full access to your items or that your driveway is clear and we are able to get our vehicles in and out safely. If we are expecting a storm please have your items out to the street side if your driveway will not be treated before our arrival. If you miss your pick up because your driver did not have access due to snow or ice we will not be able to return or reattempt service that week. If you request Orifice Recycling & Refuse to reattempt your service due to your items not being accessible or ready for pick up by 7 AM a service charge will apply to your invoice to cover this pick up. You are never stricken to capacity of your receptacles for household waste and recyclables when using our service. However large items construction debris, appliances, metal and hazardous-waste will not be collected with your regular pick up. These items will be left behind in till you contact our office to schedule a removal which will involve an additional fee based on the items you have. 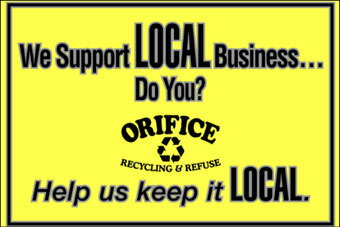 Paints oils and solvents are not included in your service and cannot be provided through Orifice Recycling and Refuse. Always feel free to contact your Board of Health to find out your towns hazardous-waste. If your driver find paint or oil's with your pick up you are held responsible for any damages this may cause to property or to disruption in our route and service. All yard waste lawn clippings leaves sticks small branches are provided by Orifice Recycling and Refuse recycling throughout the year. Always feel free to call in to schedule a yard waste pick up. All yard waste is collected with a separate truck and recycle and kept out of the waste stream. Our yard waste service cost $1.50 per paper bag or barrel and $2.00 per plastic bag.